This graph shows the density of round-trip times (RTTs) versus geographical distance from the probe source. The distance is calculated by looking up every hop's latitude and longitude via NetAcuity and comparing with the location of the source. The RTTs and distances are binned (to every 3 ms and 100 km, respectively) and counted, with the color determined by the number of hops seen with that combination of RTT and distance. The straight green line represents the theoretical best RTT (given the speed of light in fiber) for a distance. The y-axis stops at 450ms, because of the occasional high-RTT result which skews the graph. By comparing RTT values with distance, we can see how much that distance dominates the speed at which packets travel. The density plot gives a visual indication of how common different RTTs are. The round trip time for a (IP level) hop is the time (in milliseconds) that it takes for a packet to be sent from an Ark monitor to that hop and for that hop's response to be received by the monitor. Non-responding hops are ignored, and hops in a routing loop are removed. In general, a monitor with high-speed connectivity to the rest of the Internet will have a bottom-heavy grouping of RTTs that rise linearly with distance. 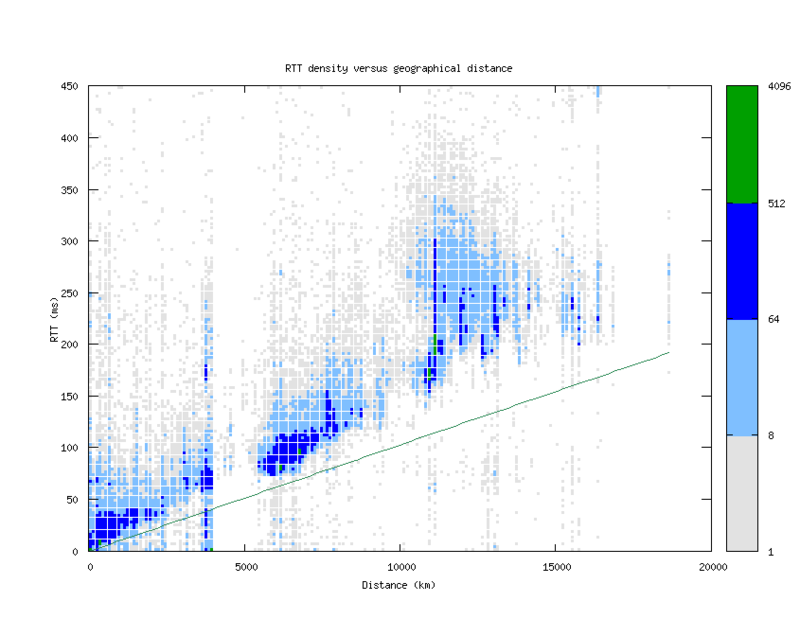 In a monitor whose connections to the Internet are slower, the RTT values are less correlated with distance and thus don't seem to form as obvious a line. It's natural to have high RTTs for a geographically close hop, given the random selection of destinations, but the unusually low RTTs for distant hops (particularly those below the speed-of-light line) are almost certainly errors due to mistaken geolocation.